The Indricotheriinae are a group of long-limbed, hornless rhinoceroses that evolved in the Eocene epoch and continued through to the early Miocene. Early paraceratheres were only about the size of dogs, but by the late Eocene and early Oligocene, they grew much larger. They flourished in the rainforests of a coastal region that became Kazakhstan, India, and southwest China, and lived further inland throughout central Asia, as well. 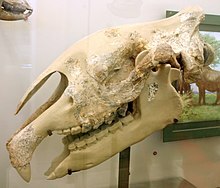 The paraceratheres reached the peak of their evolution from the middle Oligocene to the early Miocene, where they became very large, herbivorous mammals. Most genera were about the size of modern draft horses and the extinct giant horse Equus giganteus, with some growing significantly larger. The largest genus was Paraceratherium, which was more than twice as heavy as a bull African elephant, and was one of the largest land mammals that ever lived. However, they remained confined to central Asia, which at the time was part of a large, lush lowland region. The collision with the Indian subcontinent and the Himalayan uplift led to global cooling, desertification, and the disappearance of forest habitats, which resulted in the extinction of these giant ungulates. Although considered a subfamily of the Hyracodontidae by some authors, recent authors treat the paraceratheres as a distinct family, Paraceratheriidae (Wang et al. 2016 recover hyracodonts as more basal than paraceratheres). ^ Lucas, S.G.; Sobus, J.C. (1989). "The Systematics of Indricotheres". In Prothero, D. R.; Schoch, R. M. (eds.). The Evolution of Perissodactyls. New York, New York & Oxford, England: Oxford University Press. pp. 358–378. ISBN 978-0-19-506039-3. OCLC 19268080. ^ a b Wood, H.E. (1963). "A Primitive Rhinoceros from the Late Eocene of Mongolia". American Museum Novitates (2146): 1–12. ^ Palmer, D., ed. (1999). The Marshall Illustrated Encyclopedia of Dinosaurs and Prehistoric Animals. London: Marshall Editions. pp. 262–263. ISBN 1-84028-152-9. ^ H. Wang, B. Bai, J. Meng and Y. Wang. 2016. Earliest known unequivocal rhinocerotoid sheds new light on the origin of Giant Rhinos and phylogeny of early rhinocerotoids. Scientific Reports 6:39607:1-9. This page was last edited on 10 April 2019, at 22:23 (UTC).